Retinol is the technical name for Vitamin A. Vitamin A is essential to help maintain the integrity of the skin however only in a topical version rather than a supplement. What does Retinol do to the skin? Regulate sebum production to help with oil control and Acne. When Retinol is absorbed by the skin our body converts it into the active form of vitamin A (Retinoic Acid). Our skin takes this and uses it to increase our cell turnover on our skin and stimulate it back to work. Using moisturisers is actually damaging to our skin, consistent use leads to our skin growing dependent these for hydration. Using moisturisers will slow down our cell turnover. When our skin has a healthy turnover and has a repaired barrier it can start repairing our other skin issues such as acne, eczema and ageing. There are a number of different retinol products available, however, these have very different strengths. Over the counter, Retinol will have a very low strength (even 0.01%) while prescription retinoids are much more concentrated. When purchasing retinol it is important to note how it is packaged. If retinol is in a container that can easily be left open or is in contact with heat or air then it will degrade having minimal effect on your skin. 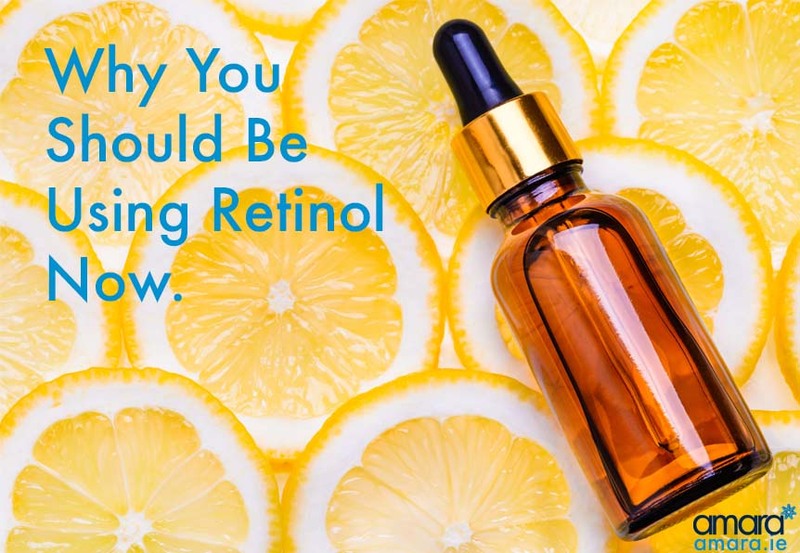 Typically retinol is used twice a day in a serum and should be the last step before sunscreen in the AM. with different strengths of retinol depending on your needs. The most basic daily serum is Daily Power Defence which continuously works throughout the day and night to protect and repair your skin from the environment. Greater strengths retinol’s are also used to target specific concerns. 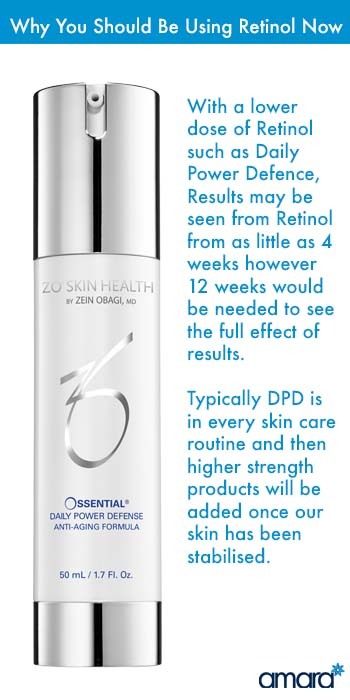 With a lower dose of Retinol such as Daily Power Defence then results may be seen from Retinol from as little as 4 weeks however 12 weeks would be needed to see the full effect of results. Typically DPD is in every skin care routine and then higher strength products will be added once our skin has been stabilised. With high strength, retinol shedding is typical with first use as our skin becomes used to producing its own moisture again. Shedding is a sign that our cell turnover is working will be explained to you when you begin any retinol product. For Daily Power Defence as this is a small dose will typically have no downtime. Am I Suitable For Retinol? Retinol can be used on the majority of skin types however a full skin analysis will be needed in order to ensure that it is right for you and whatever other products you are using.